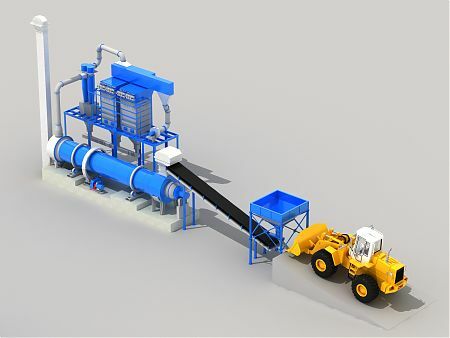 Technological complexes are designed for drying lime-stone (lime equipment) and inert materials of all types, construction rocks and other bulky materials for example: sand, gravel, ore, slag, broken stone, gypsum stone, lime-stone, dolomite as well as glass, ferrous alloy, chips and many others. Initial wet material is transported into the receiving hopper of the plant by means of conveyor or transferred by overhead crane in the self-discharging containers. Material from the receiving hopper goes to drying cylinder by means of automatic dosemeter, wherein it undergoes thermal treatment. 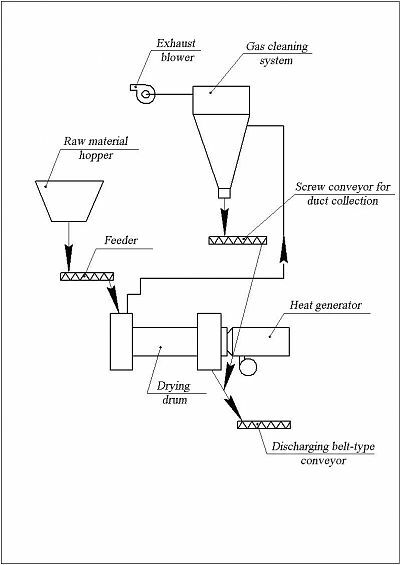 Material discharge from drying cylinder is carried out continuously to belt conveyor or intermediate hopper. Sleeve filter is used for cleaning the exit gases and aspiration air. Dust content in the plant emissions does not exceed 50 mg/m3. Material loading and unloading, maintenance all set mode parameters of complex operation: gas/air proportion on the burner, water filling of combustion products of the required temperature, power correction of the burner device at changing the efficiency of the drying process is performed automatically. The possibility of operational amendment for drying process parameters is provided as well as the individual drying programs setting for each inert material. fractional composition of initial material – up to 40 mm. *Capacity of technological complex may vary and depends on material initial moisture, burner device power and the size of a drying cylinder (diameter from 1,2 to 2,8 m).